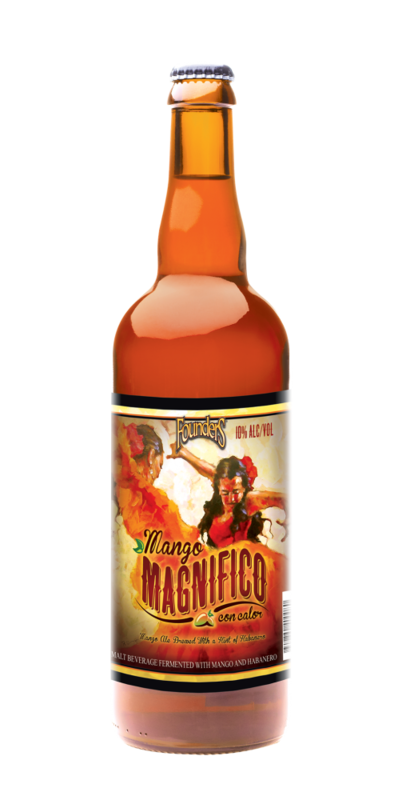 Mango Magnifico Is Our Summer 2013 Backstage Series Release - Founders Brewing Co.
Posted on June 5, 2013 by Founders Brewing Co.
We plan to introduce Mango Magnifico con Calor [Magnificent Mango with Heat], a fruit beer brewed with mango and a touch of habanero, this August to mark the seventh installment in our Backstage Series. Like all Backstage Series beers, Mango Magnifico will be sold in 750mL bottles. It will have a suggested retail price of $12.99 per bottle. Mango Magnifico is a never-before-released, high-gravity fruit beer brewed with mango and Michigan-grown habaneros. Each 750mL bottle of this 10% ABV ale is intended to be shared. Not a traditional fruit beer, the delicate tropical fruit in Mango Magnifico is punctuated by a hint of heat, increasing the overall depth of flavor and adding another level of complexity. It will be a refreshing drink for the warm summer months. We’ve had success with their interpretation of fruit beers, including the likes of Cerise, Rubaeus and Blushing Monk. But Mango Magnifico is one-of-a-kind. Mango Magnifico will be released in limited quantities across our distribution footprint beginning on Monday, August 5, and will be available at the brewery’s taproom the week prior. We expect to release one more Backstage Series beer in 2013. « Cheers to Beer City USA! Will this be a ticketed sale like Doom? That is yet to be determined at this point. We will send limited quantities of this to our Ohio distributor, Premium Beverage. They will handle allocations to retailers across the state (including in Cincinnati) from there. We are not able to ship directly. We will ship it in limited quantities to our Iowa distributor partners–they will handle getting it to markets within Iowa from there. Thanks for your interest! That is TBD at this point. Is mango magnifico con calor how you spell canadian breakfast stout in Spanish? I sure hope so. Wow Mike, soundin pretty lame right about now. any chance that some will make it to the Pittsburgh, Pa. market? We plan to send this to all of our current markets in limited quantities–so yes. If i came to the brewery for the release will there be a limit on how many bottles you can purchase? In the past we have had a two bottle limit, but we have not determined that for the brewery release at this point. I completely understand the desire of “increasing the overall depth of flavor and adding another level of complexity”, but how is this supposed to drink? On one hand you bring up the past successes of your other fruit beers (all outstanding lawnmower brews) and say that “It will be a refreshing drink for the warm summer months.” One the other, you’re bringing the touch of habanero heat and say it is “Not a traditional fruit beer”. When I buy this on Monday, August 5th; should I not share this after a long hot day, but rather postpone the engagement for a summer evening that we can devote to properly savoring the craft? Jason–We hope that you choose to crack this beer at the moment you see fit, and that you enjoy it no matter the circumstances. In short: It’s up to you. when will we know more about the release party or the limit on bottles? Please check back and we will announce more information. Thanks! Any update on whether this will be a multi-day ticketed release like Bolt Cutter and Doom were? I hope this is the case. We’re coming to Michigan from Minnesota late July/early August and are really hoping to make the release..
Hi Mike–We plan to announce details for our taproom release by the end of this month. Thanks! Will this mango beer be available in the Philadelphia area? Really want to try it. Yes, Mango Magnifico will go out to all of our markets (including the Philadelphia area) in limited quantities.